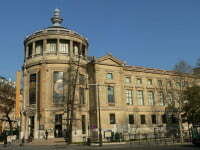 The Musée d’Histoire Naturelle (Museum of Natural History) in Paris includes the Jardin des Plantes, the Gallery of Mineralogy and Geology, the Gallery of Palaeontology and Comparative Anatomy, and the famous Grande Galerie de l’évolution (Grand Gallery of Evolution). In addition to the gardens there is also an aquarium and a small zoo, which once housed the royal menagerie and now contains some small animals in simulated natural habitats. On the end of the park is the Grande Galerie de l’évolution (Grand Gallery of Evolution), loaded with 7,000 different species of wonderful taxidermied animals, including extinct and endangered animals as well as sea and land creatures. It was built in 1899 and restored in 1994. The first two floors focus on the diversity of the world, the third on human’s impact on the environment, and the fourth on evolution. Under the soft lighting of an immense glass roof is the centerpiece of the museum: a sort of Noah’s-Ark-like procession of full size animals winding their way through the middle of the building. Opening Hours and Entrance Fees: Jardin des Plantes: Open every day from 07:30 to 20:00. Free Entrance Greenhouse: Open every day from 10:00 to 18:00, except on Tuesdays.